According to coastal place names expert Andrew Scott, the oldest surviving European place name in B.C. is the San Cristoval Range, accorded on July 23, 1774 by Juan Pérez, captain of the the first documented voyage of Europeans to set eyes on the B.C. coast. Crespi’s diaries were published in Spanish in 1857, leading to H.E. Bolton’s Fray Juan Crespi: Missionary Explorer on the Pacific Coast 1769–1774 (1927). The Pérez expedition opened the world’s last unmapped temperate zone to exploration. His voyage produced the first crude map of the B.C. coastline from eyewitness experience, but British Columbians remain mostly unaware of Pérez because the early Spanish history of B.C. was expunged by British colonialism. As well, Spanish historians dismissed Pérez because he failed to place a cross and claim sovereignty for Spain, and he failed in his mission to detect Russian incursions in northern waters. Original documents from Pérez’s voyage ended up in the Archivo General de la Nación in Mexico City and the Naval Museum in Madrid, but were ignored for more than a century until a doctoral student named Olive Johnson undertook some preliminary translations in 1911. 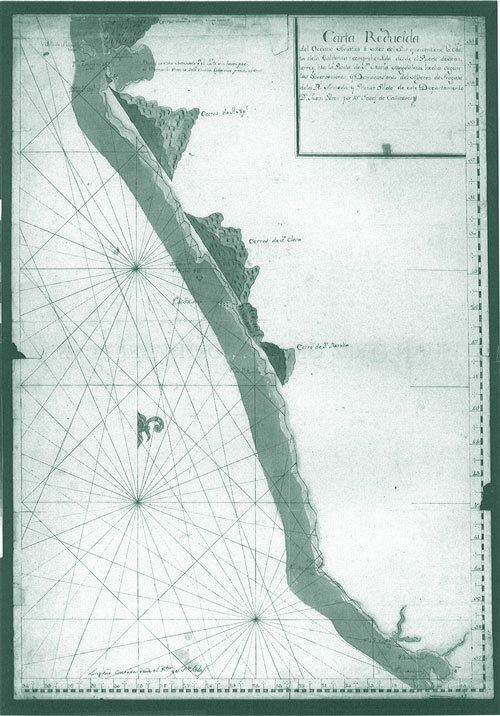 Portland historian Herbert K. Beals translated and annotated Juan Pérez on the Northwest Coast: Six Documents of His Expedition in 1774 (1989) for the Oregon Historical Society, providing the first account in English of the Santiago’s seven-month voyage. There is no strong evidence that a monk from China named Hui Shen reached the west coast of the North American continet in the fifth century or that Sir Francis Drake came as far north as the land we now call British Columbia. If one chooses to discount the written evidence that the Greek mariner Ioannis Phokas, better known by his Spanish name Juan de Fuca, must have reached the strait the bears his name in 1592, one has to conclude, due to written accounts, that Pérez and Crespi were aboard the first European ship to reach British Columbia waters. Juan Pérez was the first European known, for certain, to have reached British Columbia waters but history has mostly failed to recognize him for opening the world’s last unmapped temperate zone to exploration—and for producing the first map of the British Columbia coast drawn from eyewitness experience. 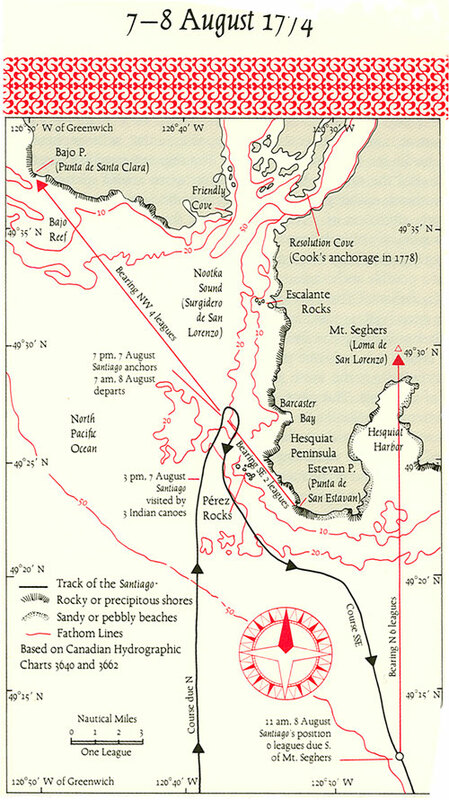 Although his ten-month voyage in 1774 has never ranked high in the annals of great maritime achievements, Pérez made the first verifiable European contact with British Columbia’s indigenous people after the Spanish court had been alerted to incursions in the north Pacific by their ambassador to the Russian court in 1773 [see Quadra entry]. Both Pérez and his mercurial second-in-command, Esteban José Martínez, who would instigate the Nootka Crisis in 1789, kept kept diaries in 1774, as did two Catholic priests on board. The Martínez entry for July 20 is significant because he notes the presence of “half of a bayonet and… a piece of a sword made into a knife” among the Indians at a place the Spaniards named Santa Margarita (now believed to be Langara Island, of the northern edge of Haida Gwaii). Diaries were sent to the Viceroy who instructed Melchor de Peramas to make copies. Copies sent to Madrid ended up in the Archivo General de Indias in Seville. Original documents from the voyage have ended up in the Archivo General de la Nación in Mexico City and the Naval Museum in Madrid. These first reports of British Columbia were ignored for almost two centuries. A doctoral student named Olive Johnson undertook some preliminary translations in 1911 and the Oregon Historical Society arranged for microfilm versions in 1977. Portland historian and researcher Herbert K. Beals finally translated and annotated their publication in 1989. Juan Pérez, his second-in-command Estéban José Martínez and the priests aboard the 82-foot frigate Santiago kept diaries that recorded this first encounter with indigenous peoples. Constructed at San Blas, Peréz’s corvette Santiago weighed 225 tons and measured 82 feet long. It embarked on January 24, 1774 carrying 88 officers and men, plus 24 passengers, many of whom were bound for Monterey. The first five months of Pérez’s maiden voyage with the Santiago were passed in southern California waters, south of San Francisco.The Santiago remained in San Diego for structural repairs from March 11 to April 6. It reached Monterey on May 8 and remained there until June 11. Keeping well out to sea, Pérez became concerned about his ship’s low water supply. He sailed northeast and reached British Columbia on July 18, 1774, sighting the northwestern coast of Graham Island, the largest of the Queen Charlotte, also known as Haida Gwaii, just prior to noon, and sailing within two miles of Langara Island. Unable to find a secure harbour to drop anchor, Pérez named the headland Punta Santa de Magdalena. The following afternoon around 4:30 p.m., as Pérez drifted north, three canoes approached. The Spanish traded beads for dried fish. On the following day, 21 Haida canoes appeared, of differing sizes. Two of the canoes had only women and children aboard. “Two of the pagans came aboard the ship,” wrote Father Crespi, a Spanish priest, “and were much pleased with the vessel and things on board of it.” Father Crespi had joined the Pérez expedition in Monterey with Father Tomás de la Peña y Saravia. 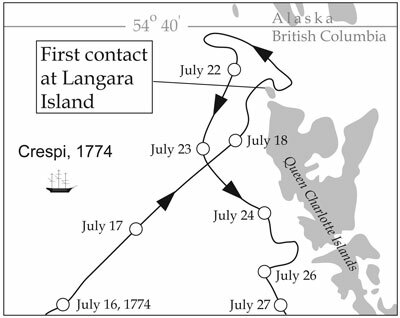 In 1792, the Spaniard Jacinto Caamaño realized that Pérez had approached a smaller island, separated from Graham Island by Parry Passage, and he gave it the name Isla Langara—arguably the birthplace of modern British Columbia because off its shores “first contact” was made. Pérez named the coastal mountains Los Cerros de San Cristobal but he never risked going ashore. Pérez sailed north to 54º but was leery of advancing further towards Tlingit territory where he believed the Russian Chirikov had lost his men in 1741. “The Indians told us not to go to that land,” he wrote, “for they [the natives there] shot arrows and killed [people].” In fact, Chirikov’s crew went ashore almost 200 nautical miles north of where the Spaniards recognized the fragments of a bayonet and swords. Sailing south, Pérez reached the outskirts of Nootka Sound on the west coast of Vancouver Island on August 7. The crew’s attempt to take ashore a 14-foot cross made by the ship’s carpenters was prevented by rising winds. This cross was inscribed with the initials I.N.R.I., signifying Jesus Nazarenus Rex Judaeorum, and it was dated Carolus Tertius: Rex Hispaniarum; ano 1774. Anchoring with difficulty near rocks off a small peninsula, he traded with the Nuu-chah-nulth, during which time some silver spoons were allegedly pilfered. These spoons would come to the attention of Captain James Cook four years later upon his landing at Nootka Sound in 1778. Cook’s journal mentions two spoons that were hung around an Aboriginal’s neck as ornaments. The purchase of these two spoons by a British seaman was recorded in at least four memoirs that arose from Cook’s final voyage. Although there’s no record of Pérez’ men trading with spoons in 1774, it has been suggested that these spoons might not have been stolen as alleged. They could have been left in the pockets of garments that were exchanged, or simply provided as gifts. Regardless, Spain would cite the spoons as evidence that Spain had preceded the British to British Columbia. In addition to the spoons, Pérez also left behind his anchor. As weather conditions changed and he found himself in danger of being driven onto the rocks—now called Pérez Rocks—he was unable to raise his anchor. Pérez cut the cable and sailed away, but not before he had named the entrance to Nootka Sound as Rada de San Lorenzo. On their return journey, the Spanish might have seen the entrance to the Strait of Juan de Fuca—as Martínez later claimed—but it is certain they saw a prominent mountain on August 11 near Cape Flattery. Pérez named it Sierra Nevada de Santa Rosalia. In June of 1788 this was renamed Mount Olympus by John Meares. With his crew threatened by scurvy, Pérez reached Monterey on August 28, and finally returned to San Blas, much the worse for wear, on November 5. News of Pérez’s voyage came as a disappointment to Spanish authorities because he had sailed only to 54º and 40 minutes north, not 60º north as instructed. Pérez had also failed to reassert Spanish dominion for King Carlos III by enacting formal ceremonies of possession, as instructed. Spain had claimed sovereignty over the coastlines of North America ever since Nunez de Balboa crossed the Isthmus of Panama and claimed the Pacific Ocean, and all the shores that washed upon it, in 1513. Pérez didn’t encounter any Russians and he didn’t produce detailed charts. His pilot Josef de Cañizarez nonetheless produced a coastline map that included Nootka Sound (Surgidero de Sn. Lorenzo), the northern tip of Graham Island (Pta. De Sta. Margarita) and Mt. Olympus (Cerro de Sta Rosalia). Demoted, Pérez sailed north a second time, this time as Pilot for Don Bruno Hezeta’s voyage in the Santiago in 1775. During this follow-up expedition that included two ships, Captain Bodega y Quadra sailed north on the schooner Sonora, with Maurelle as his pilot, and named the strait north of the Queen Charlotte Islands as Pérez Inlet. It is now called Dixon Entrance. Juan Pérez died, possibly of typhus, somewhere off the California coast, on November 3, 1775. During the ship’s return to San Blas, Pérez was buried at sea. 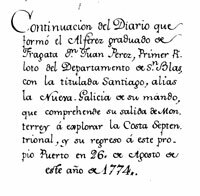 The original copy of Juan Pérez’s report of his 1774 voyage is in the Museo Naval in Madrid. A copy was made available in Spanish in 1968, and translated into English in 1989. A book review by John Kendrick of Herbert K. Beals’ edited versions of the diaries from the historic Pérez voyage of 1774 can be found in BC Studies, Winter, 1990-91 (#88). San Blas de Nayarit, Vol. II (Mexico: Secretaría de Marina, 1968). Enrique Cárdenas de la Peña, editor. 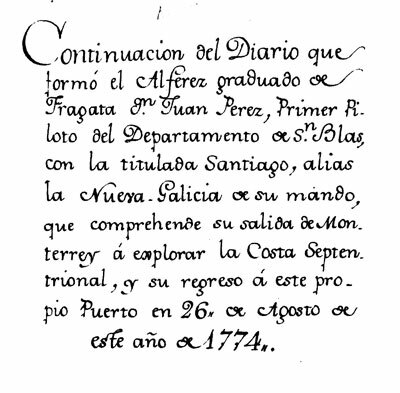 A page from Juan Pérez’s diary. With truce-like solemnity, prior to international sporting matches it’s customary for players to stand at attention as national anthems are played. As indicated by John Sutton Lutz’ essay in Myth & Memory: Stories of Indigenous-European Contact (UBC $32.95 pb $85 hc), the ambassadorial power of music has surely arisen from some deep-seated human impulse that is likely prehistoric, and therefore beyond analysis. According to Lutz, the crews of Captains Juan Perez and James Cook—the first two European explorers known to have reached B.C. waters—were both serenaded by music from Aboriginals upon their arrivals, in 1774 and 1778 respectively, and both crews cast their own music upon the waters in exchange. “As they were now very attentive & quiet in list’ning to their diversions, we judg’d they might like our musick, & we ordered the Fife and drum to play a tune; … they Observd the Profoundest silence, & we were very sorry that the Dark hind’red our seeing the effect of this music on their countenances. Lutz, who teaches history at the University of Victoria, is working on a book based on close to two hundred different surviving accounts, recorded between 1789 and the present, of how indigenous people perceived the arrival of Europeans on the west coast of North America. His contribution to this anthology of essays which he edited—derived from a confab of academics at Dunsmuir Lodge near Victoria in 2002—teasingly offers tidbits from his research. We learn that George Vancouver’s arrival in the harbour that bears his name, like the arrival of Cortez in Mexico, occurred at a “spiritually potent time,” vastly increasing his importance. According to Squamish elder Andrew Paul, his people believed some disaster was scheduled to befall them at seven-year intervals and Vancouver’s appearance happened to coincide with the culmination of that cycle. Whereas the Nuxalk weren’t sure if the European arrivals were from the sky or from the land of the dead, the Squamish, according to Louis Miranda and Philip Joe, were thought to be from the land of the dead because their faces were pale and they were wrapped tightly in blankets, like corpses. The Nuu-chah-nulth in Nootka Sound, however, were assumed Cook’s men came from the moon, one of the most powerful of all spirits in their cosmology, because they wore yellow and their brass decorations shone like the moon. As Lutz concludes, “Rather than immediately destabilizing traditional beliefs, the arrival of Europeans was merely part of the ongoing proof of these beliefs. First contacts in our part of the world only date back a few centuries, so Myth & Memory is a terrific idea for a book. Unfortunately the contributions include encounters that occurred as far afield as Utah, Virginia and the Kalahari Desert. Five of the chapters concern the coastal areas of British Columbia; two analyze contact stories from Chilliwack and the Okanagan. The ardent history buff will find the text riddled with gems. Fort Vancouver, for example, was known by indigenous people as “the place of mud turtles.” But for the so-called general interest reader, Myth & Memory is a stylistically obtuse and daunting mish-mash of academics talking to each other, pointing the way to a more intriguing work yet-to-come. As Principal Researcher at the Oregon Historical Society, Herbert K. Beals, a retired regional planner, specialized in maritime exploration of the Pacific Northwest. Accordingly he translated and annotated the journals of the first European expedition known to have reached British Columbia waters, Juan Pérez on the Northwest Coast: Six Documents of His Expedition, 1774 (Oregon Historical Society Press, 1989), as a follow-up to having edited and translated the records of the first European expedition known to have made landfall on the mainland of the Pacific Northwest, For Honour and Country: The Diary of Bruno De Hezeta (Oregon Historical Society, 1985).